Ladies and gentlemen, I give you the epitome of the IoT-enabled product: the trash can! My reader statistics do not indicate this blog has a heavy readership among trash cans, but let me apologize in advance to them for what I’m about to write: it’s not personal, just factual. I’m sorry, but you municipal trash cans are pathetic! Dented. Chipping paint. Trash overflowing. Smelly. Pests (ever seen any of those prize city rats? Big!!!) Sometime even knocked over. And, worst of all, you are so…. DUMB. You just sit there and don’t do anything. I have seen the future of trash cans, and, equally important, perhaps the best example I’ve seen of how smart designers and company strategists can –and must — totally rethink products’ design and how they are used because of the Internet of Things! At last week’s Re-Work Internet of Things Summit there were many exciting new IoT examples (I’ll blog others in coming weeks) but perhaps the one that got more people talking was the BigBelly trash compactor & recycling system, high-tech successor to the lowly trash can. The company’s motto is that they are “transforming waste management practices and contributing to the Smart Cities of tomorrow.” Indeed! I was first attracted to the BigBelly systems because of my alternative energy and environmental passions: they featured PV-powered trash compactors, which can quintuple the amount a trash container can hold, eliminating overflowing containers and the need to send trucks to empty them as frequently. Because the containers are closed, there’s no more ugly banana peels and McDonald’s wrappers assaulting your delicate eyes — or noses! Equally important, each is paired with a recycling container, which are almost never seen on city streets, dramatically reducing the amount of recyclables that go into regular trash simply because no recycling containers are accessible downtown. These features alone would be a noteworthy advance compared to conventional trash cans. But BigBelly wasn’t content to just improve the efficiency of trash and recyclable collection: they decided to make the containers smart. The company worked with Digi to add wireless communications to the bins. This is a critical part of BigBelly’s broader significance: when the IoT first started to creep into corporate consciousness, of course designers thought about smart versions of high-value products such as cars, but lowly trash cans? That deserves real praise, because they fundamentally re-examined not only the product as it existed, but also realized that an IoT-based version that could also communicate real-time data would become much more versatile and much more valuable. instead of traditional pickup routes and schedules that were probably based on sheer proximity (or, as BigBelly puts it a little more colorfully, “muscle memory and gut instincts”), they now offer a real-time way to monitor actual waste generation, through the “CLEAN Management Console,” which allows DPW personnel to monitor and evaluate bins’ fullness, trends and historical analysis, for perspective. Collections can now be dynamic and driven by current needs, not historical patterns. For those cities that opt for it, the company offers a Managed Services option where it does the analysis and management of the devices — not unlike the way jet turbine manufacturers now offer their customers value-added data that allows them to optimize performance — and generates new revenue streams for the manufacturers. You may remember that I blogged a while ago about the “Collective Blindness” analogy: that, until the IoT, we humans simply couldn’t visualize much about the inner workings of the material world, so we were forced to do klugy work-arounds. That’s not, strictly speaking, the case here, since trash in a conventional can is obviously visible, but the actual volume of trash was certainly invisible to those at headquarters. Now they can see — and really manage it. They can dramatically increase recycling programs’ participation rate and efficiency. As BigBelly says, the system provides “intelligent infrastructure to support ongoing operations and free up staffing and resources to support new and expanded recycling programs. Monitoring each separate stream volumes, days to fullness, and other activities in CLEAN enables you to make changes where needed to create a more effective public recycling program. Leverage the stations’ valuable sidewalk real estate to add messaging of encouraging words to change your users’ recycling behaviors.”Philadelphia is perhaps the best example of how effective the system can be. The city bought 210 of the recycling containers in 2009. On average, each collected 225 pounds of recyclables monthly, resulting in 23.5 tons of material diverted from landfills. Philly gets $50 per ton from the recycling — and avoiding $63 in landfill tipping fees, with a total benefit to the city of $113 per ton, or $2599 per month. Here’s where it really gets neat, in my estimation. Because the BigBellys are connected in real time, the devices can serve a number of real-time communication functions as well (enabled by an open API and an emphasis by BigBelly on finding collaborative uses). That includes making them hubs for a “mesh network” municipal wi-fi system (which, by the way, means that your local trash container/communications hub could actually save your life in a disaster or terror attack, when stationary networks may be disrupted, as I explained years ago in this YouTube video). The list of benefits goes on (BigBelly lists all of them, right down to “Happy Cities,” on its web site). 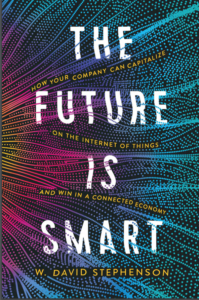 Trust me: if my premise is right that we can’t predict all of the benefits of the IoT at this point because we simply aren’t accustomed to thinking expansively about all the ways connected devices can be used, there will be more! If something as humble and ubiquitous as a municipal trashcan can be transformed into a waste-reduction, recycling collection, municipal communication hub, then to fully exploit the Internet of Things’ full potential, we need to take a new, creative look at every material thing we interact with, no longer making assumptions about its limited role, and instead looking at it creatively as part of an interconnected network whose utility grows the more things (and people!) it’s connected with! Let me know your ideas on how to capitalize on this new world of possibilities!